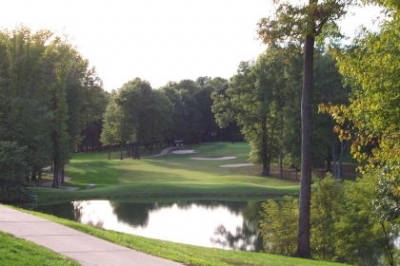 WALDORF, MD - It's a well-known fact in the golf world that courses sometimes receive makeovers to correct glaring problems; and sometimes they change their names; and on other occasions, they'll even transform into something newer and better. Glancing back on the par five 16th hole, there's a lot of water, and a lot of beauty to behold. How about all three at once? That's what's happened at Atlantic Golf's Potomac Ridge. Formerly known as South View, the property and the golf course were purchased in 1999 by the Birney family's Atlantic Golf Corporation. Its metamorphosis wasn't entirely because the club had fallen on hard times, but because the Birneys thought they could help South View realize its promise. Charlie Birney explains: "South View Golf Course was about 2 1/2 years old when we bought it. It was full of rocks, had very little contour and was pretty rough looking. It'd been developed very economically and was rather plain, but we also realized it had great greens. There definitely was potential to turn it into a first-rate facility, and that's our mission." The 18th hole is an uphill, dogleg left, par four. You'll need one more accurate tee shot to approach par here. It's nice that Birney didn't already claim complete success, because that might imply they've stopped working towards perfection. Atlantic Golf has certainly devoted time and resources to develop Potomac Ridge, and there are signs everywhere that they're moving in the right direction - to provide the same 'Atlantic Golf Experience' you'll find at their other two facilities, Queenstown Harbor and South River. They've certainly got a rolling start. The construction of an additional nine holes opening next spring will supplement the already attractive eighteen-hole layout. It's an Ault, Clark & Associates design that's been 'upgraded' to improve on South View's lukewarm reputation - primarily by adding mounding, improving playing conditions, and providing the service you'd expect from Atlantic Golf. The new nine was designed by Tom Walker, and includes three par fives (par 37). Birney said the property's location also figured into their decision to purchase it: "Prince Georges County is growing and progressing very rapidly and the future looks bright for this area. 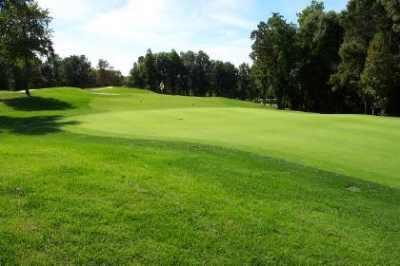 So we found this property, which included a lot of extra land, and saw the potential to clean up the existing course and then add the third nine." Looking back from the 5th green, you'll notice the tight nature of the front nine. "Now we're looking for the best means to utilize the three nines at the facility, and make sure it's a great place to play for all skill levels. We're also looking at ways to promote youth golf programs of all natures and variety. 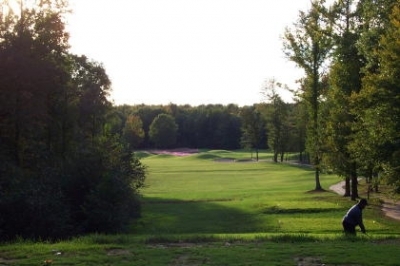 Needless to say, we're all very excited about the possibilities - and we've put a lot of effort into placing Potomac Ridge on par with our other courses," Birney added. Birney's enthusiasm is contagious, and also seems to have infected the staff, lead by Head Golf Professional Terry Shaffer: "To see what the ownership has done with this facility is just incredible. Our greens are in tremendous condition, and the switch from Bentgrass to Bermuda a couple years back really helped with the maintenance issues. We're fostering a reputation for quality, and we'll also moving towards hosting competitive events here in the future." Shaffer continues: "We've got some great golf here, and it's just a matter of getting the word out. Each of our nines has a real different character, which gives folks the variety they're looking for. The front nine (of the current 18 hole course) is probably a little gentler and more traditional than you'll see at the other Atlantic Golf facilities, and the back nine reminds me a lot of North Carolina. You get down there, and you're in the swamps - it's kinda neat." 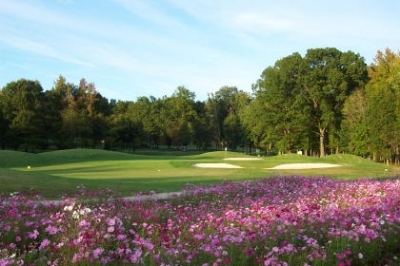 Wildflowers dot the course at Potomac Ridge. Here, it's with a view of the 7th green. And everyone is very energized about the new nine, too. Shaffer describes it: "The original thinking behind the new nine was to make it an instructional course. We didn't want to build necessarily the most difficult golf course, but the most enjoyable golf course. So that meant really taking into account the forward sets of tees, with ladies and higher handicapped golfers in mind. But from the back tees, it's a really solid test for good players, too." Shaffer says they designed the hazards to challenge the better golfers to score low, yet leave the duffers alone: "We estimated the distances that each type of player would hit their tee shots, then positioned the trouble accordingly. There's a lot of risk-reward out there, and if the good players want to enjoy easier approach shots, they'll have to be accurate off the tee. Shorter hitters will stay short of the hazards, so they'll be able to get around a little easier. But the goal was to make sure it was enjoyable for all, and I'll boldly claim we've achieved it." Estimated distance off the tee is the determining factor for which tees you play at Atlantic Golf courses, which offers a refreshing alternative to the traditional 'If you're a 20 handicap, play the white tees' approach that most clubs take. You'll have to carry water off the tee of the 11th hole, but the distance probably won't scare too many folks. Speaking from experience, some long hitting hacks with higher handicaps have the distance to play the back sets of tees, yet struggle in the shorter areas of the game. To play forward will take the driver out of these players' hands, which might be a good thing, yet would lessen the experience. Not so at Atlantic Golf facilities. As alluded to above, there was a switch of grass surfaces at Potomac Ridge that really made a difference a few years back. Birney explains: "Switching Potomac Ridge to Bermuda from Bentgrass was one of the smartest things we've ever done. This summer was a perfect example of how the more heat tolerant, less water dependent Bermuda grass can keep your course green and playable throughout the hot months, while newer bent courses are suffering. This type of grass doesn't even want the water." Even well into fall, the Bermuda surfaces were lush and green. Made me a believer. It may not look like it, but there's plenty of room off the 13th tee. Just don't go left. 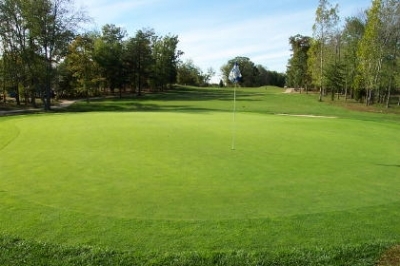 Finely conditioned surfaces help you on this short-ish 6603 yard, par 71 layout. 6600 yards is a mere sneeze to most long-hitters these days, yet Potomac Ridge is hardly defenseless. From the back tees, several tee shots must navigate narrow passages, and tree limbs will often deflect balls fired just a bit off line. Once you're in the landing areas, however, the course opens up considerably, making it a very player-friendly experience. Take that into consideration when choosing clubs from the tee. 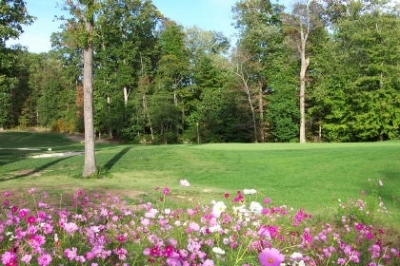 Shaffer describes the course: "It's fairly tight in certain areas, but I also think it's an extremely fair golf course. It's not long - most courses these days are over 7000 yards, but we're very manageable here at 6600 from the back tees. We've got some short par fours, and there are a few holes that are real good tests, like sixteen (543 yard, dogleg right par five). Ten is also a difficult hole (398 yard par four with a left to right sloped fairway), because that's a difficult shot coming into the green there, over the creek." "It has some danger on it, some environmental areas and things like that. But people who think their way through a little bit can play very easily, and how long you hit it isn't always the question. We've got four sets of tees, so there's a tee for women, seniors, men and a championship set. The remark we get most from our customers is, "Gosh, that was fun." That's really what we're after," Shaffer added. A colorful look at the 14th green in the distance. Don't forget to stop and smell the wildflowers. Highlights on the front nine include the second hole (#2 handicap), a challenging 430 yard par four doglegging slightly left. 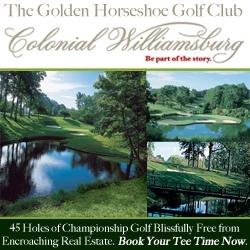 From the back tees, it�s a narrow driving hole, but once you�re at the tee shot landing area, it�s quite open. Bunkers guard short-left and long, so choose your approach club carefully. Eight is an interesting short par four. 315 yards in length, it's potentially reachable with a stiff tail wind and dry conditions, because you'll get some downhill roll off your tee ball if you clear a small ridge that crosses the fairway. The back nine is considerably more scenic, and there are definitely shades of 'Carolina, as Shaffer suggested - starting with the tenth hole. As mentioned above, it's not overly long at 398 yards, but you must keep your tee balls to the left side of the fairway, or you'll risk rolling into the water guarding the right side of the landing area. Then it's an uphill approach shot over water. Tough hole. Sixteen is probably the signature hole (543 yard par five, the #1 handicap hole). You'll want to club down off the tee, as shots hit too long will reach a fairway bunker, or worse, the water. From that point, it's definitely a lay-up, as you'll probably have 300 yards left to the green. Approach shots must be precise, too, as water guards short, and bunkers long. Beautiful, but challenging. 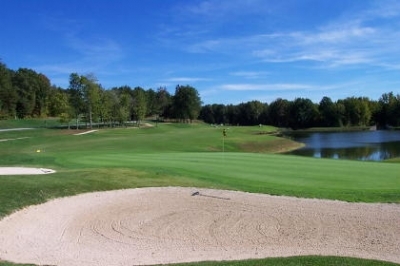 In addition to Atlantic Golf at Potomac Ridge's already considerable attributes, it's also convenient to get to. Shaffer says, "We're only 10 - 12 miles from downtown DC, which makes us very convenient to golfers from all over the region. We're even starting to draw more folks from northern Virginia, when they discover how easy it is to get here. We see that as a major positive." Just one of many when you're talking about Potomac Ridge. They've got 27 holes of pretty darn nice golf, excellent 'Atlantic Golf' service and a healthy, assertive orientation towards the future. Job well done. Note: Check links below for reviews of other Atlantic Golf Courses. Mon-Fri, $43. Twilight rate is $33. Weekends, $59. Twilight rate is $38, and pre-twilight is $48. All rates include cart. Mon-Fri, $36. Twilight rate is $28. Weekends, $48. Twilight rate is $32. Again, all rates include cart. Range balls are $5 a bucket. Walking is allowed, but there isn't a walking rate.